So much going on...what a confusing batch of comics. Don't worry, it all comes together next week. Who could the special guest be? So much preparation is going into the visit, must be a real V.I.P! Here's the CALAMITY JACK cover! Click to embiggen, trust me, you want to embiggen. I was a little nervous about posting the cover artwork, even though it had been seen in public at Comic-Con, then I saw it was already up on Amazon. Woohoo! Let the countdown to January 2010 begin! We just got back from San Diego about two hours ago, we drove all day. We forgot to empty the kitchen trash can, so the house STINKS. Anyway, Comic-Con was super, super fun. 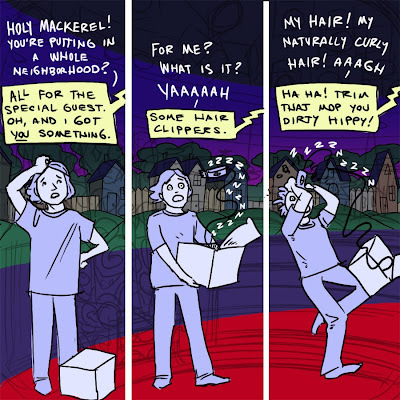 RAPUNZEL'S REVENGE did not win the Eisner for "Best Graphic Novel for Teens/Tweens" the award went to Neil Gaiman's CORALINE graphic novel. But the nomination is enough for me--it was a big honor to be seated with all the other nominees and attend the ceremony. I got to meet a lot of great writers and illustrators, including Holly Black (the Spiderwick author), Jennifer Holm (the Babymouse author) Chris Schweizer (author of another Tween nominated book CROGAN'S VENGEANCE) and Mouse Guard creator, David Peterson. I even spent some time with some of the screenwriters working on THE DEVIL YOU KNOW movie. Here's hoping for a CALAMITY JACK nomination, so I can go again. 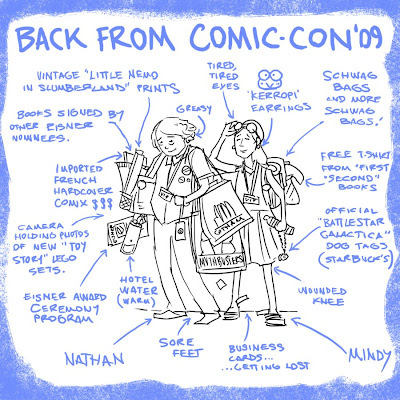 COMIC-CON 2009! Live from the show floor! 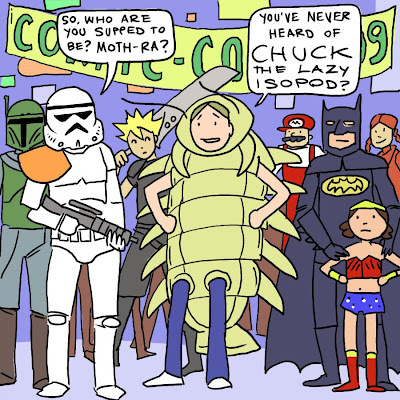 I finally made it to Comic-con. The Eisner Award ceremony is tonight. Anything could happen! It's true, I'm supposed to be in San Diego at Comic-Con right this second. I should be there in time for the big Eisner ceremony tomorrow. 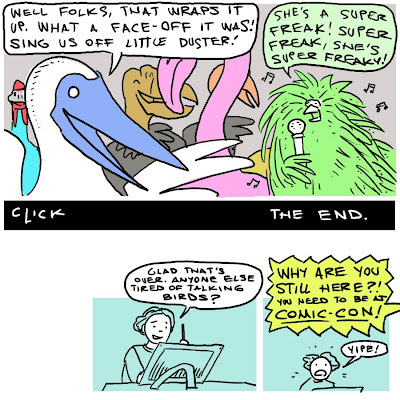 Keep those fingers crossed, we want RAPUNZEL'S REVENGE to win, we're nominated in "Best Graphic Novel for Teens." It's a long shot, one of the books in our category, SKIM by Mariko and Jillian Tamaki, is also up for "Best Graphic Novel of the Year." So if you're laying bets, SKIM would be the safe way to go. We're thrilled just to be nominated, and Comic-Con should be big fun. More soon. Men walked on the moon! July 20, 1969. 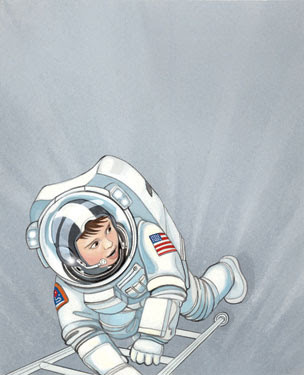 Note: Image does not show Neil Armstrong, rather, the kid from Balloon on the Moon. 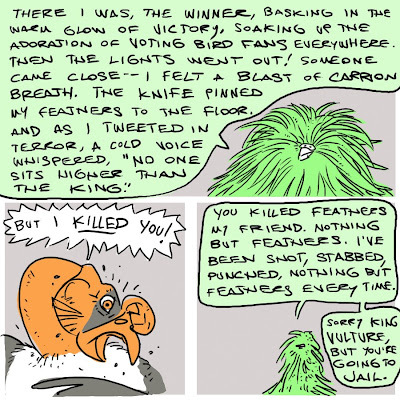 Thanks to everyone who participated in the pledge drive, we can now get back on track with the Bird-Face killer. I finished my picture book project over the weekend. The book, ANIMAL HOUSE, will be out Summer 2010. I'll show a preview sometime in the future. It's about a house made out of animals--for example, the floor is made of "Floormingos" and the roof is a "Giroof." It's a lot of fun and I'm excited to see it come out next year. 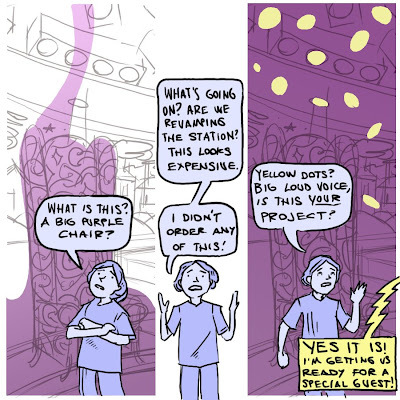 It's not a good mystery unless it gets interrupted by a pledge drive. Lucky for you, this one only lasts as long as it takes to read. I hate pledge drives. I've got full illustrations for a picture book due Monday morning, I've still got a few paintings to polish (one's still only in pencil!) wish me luck, it'll be a LOOOOOOONG weekend. If you've noticed my post times this week, you'll see what kind of hours I've been keeping to meet this deadline. Cheers everybody. And support the S.S.N. brought to you by Viewers Like You. 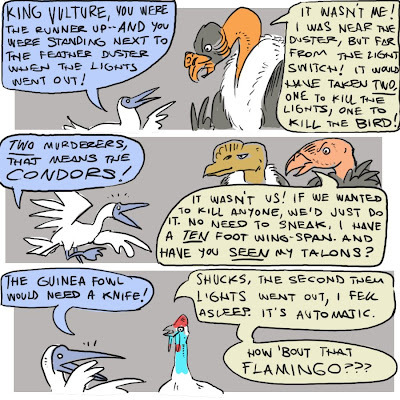 Props to commenter DavidM, who gave us the "Fowl Play" title. 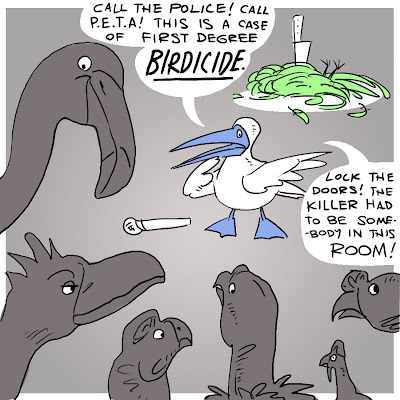 Who could have guessed the Bird-Face Face-Off would end in tragedy? It was a shock to me too! 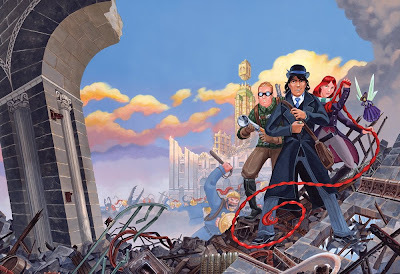 Let's look for clues--we need to get to the bottom of this. 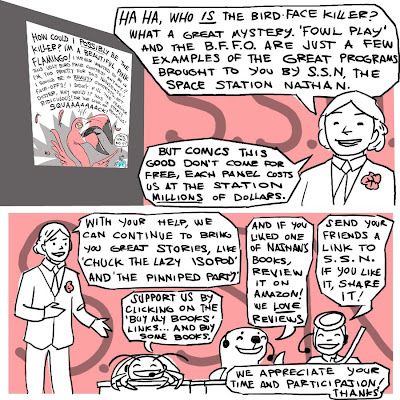 Here it is, the final line-up of the Bird-Face Face-Off. Voting is now open and will remain open through the weekend. 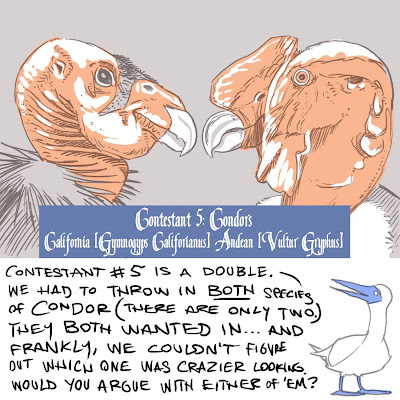 Vote by putting your bird's number into a comment in the comments section. 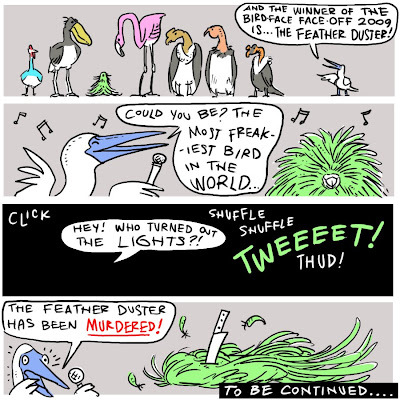 What will the winning bird receive? 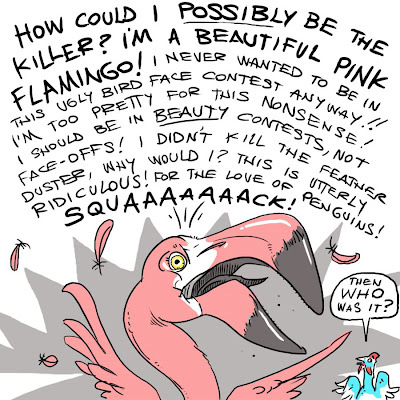 Prestige, honor, the title of "Bird Face of the Year," and a starring role in an upcoming comic. 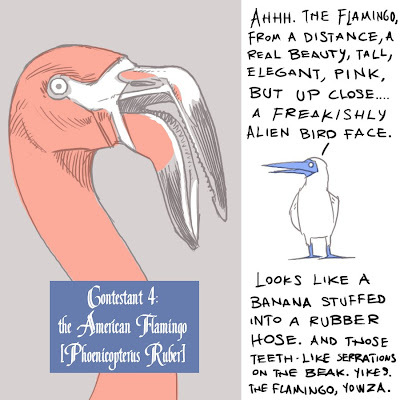 Remember, according to the blue-footed booby, we are looking for the "craziest" bird face, whatever that means. 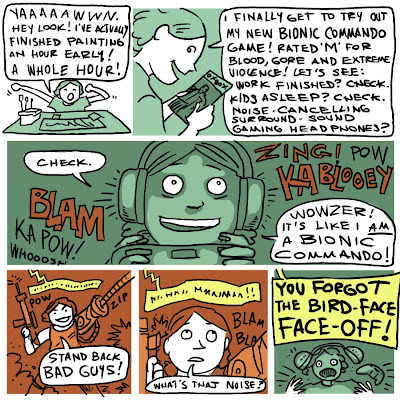 The horrible irony of this cartoon is that I never got to play my game--I was making the cartoon of me playing the game and my wife snuck in and claimed the TV room. 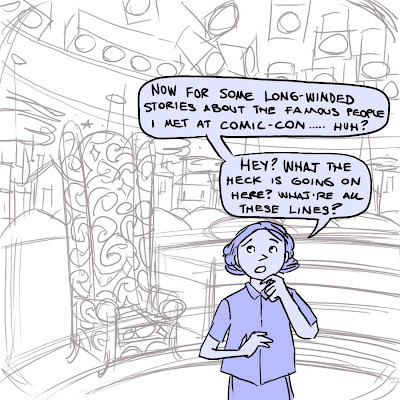 Note to self, play game FIRST, then write cartoon about it. 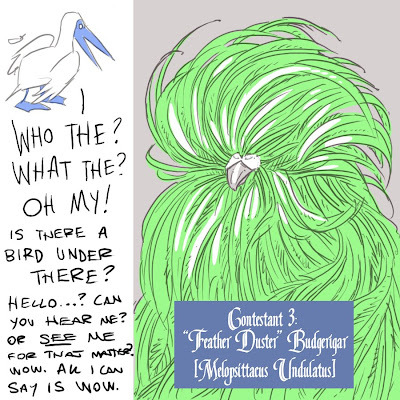 The Bird-Face Face-Off Finale will be up tomorrow, and we'll have the whole weekend to vote. So be thinking of the bird you'll pick! There you have it, all six contestants have now been seen. Tomorrow we'll recap, line them all up and begin the voting process. A lot is at stake here. We've got some real contenders. It's very exciting, like a mix between the Miss USA Pageant and the Eukaneuba Dog Show. 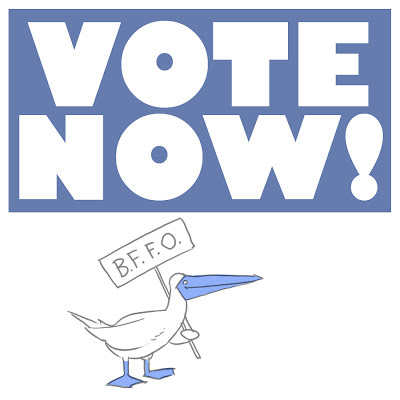 Only one bird left in the BFFO 2009. Who will it be? 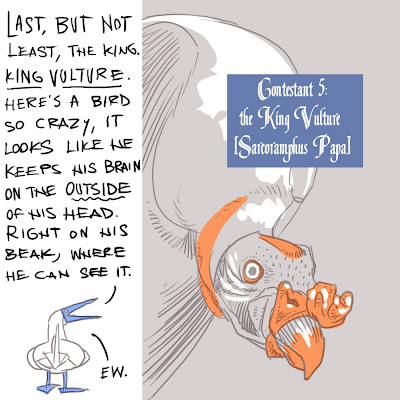 Now, let me make one thing clear; these aren't the craziest bird faces of all time, just 2009. I'm sure there are some stellar candidates that we missed this year. We only have room for six, well, with today's candidate seven. 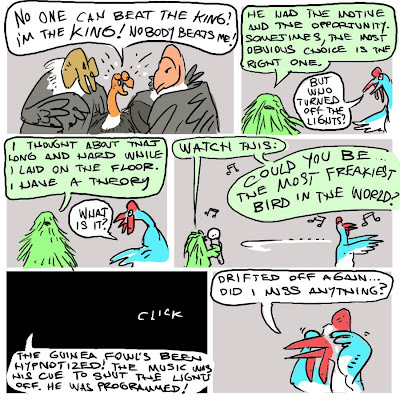 Don't be disappointed if your favorite freaky bird doesn't show up. There's always the next BFFO. 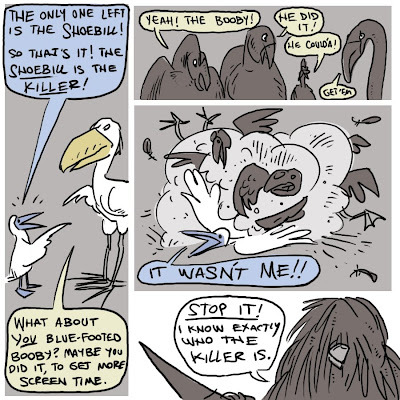 Who knows when that will be, birds aren't great planners. The Face-Off's back on after a holiday break. I felt like I needed to draw a Rapunzel--I'm used to drawing 12 Rapunzels a day, it's hard to stop cold turkey. I had to get my fix. 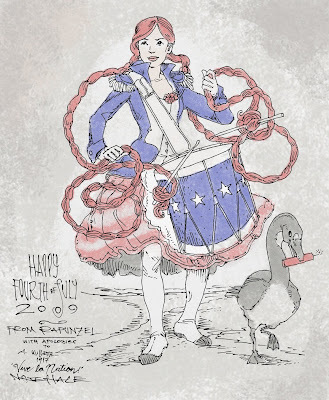 Also, I may have stolen this pose and costume from a country not my own. Is that patriotic or what? This one's another one you have to see to believe. It's not a species, it's a super rare mutant strain of budgerigar (or parakeet--same thing.) Do a little search for real pics of this thing, it'll blow your mind. That's half the face-off contestants, any front-runners? Favorites? Anybody have money riding on this? 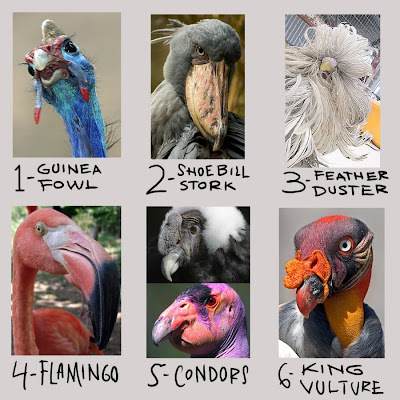 We'll do the official voting after all six birds have shown their faces. Should be exciting!